Recently I bought a used FZ-1 with a dead disk drive. Fortunately, the disk controller itself was alright, but the drive was broken. Casio, however, decided to implement the standard Shugart bus instead of the (nowadays widely used) PC/AT disk bus which -- at first sight -- drives a normal PC disk drive useless as replacement part. To fight spam, I'm running RBL-based filtering and Greylisting, so if your ISP's mail server is blacklisted or doesn't play according to the SMTP RFC, you might encounter bounces. For some kind of reason (there must be one...) the so-called Japanese 3.5" floppies spin with 360rpm like the old 5.25" drives instead of 300rpm as the rest of the world does. Casio, in their eternal wisdom, decided to use such a non-standard configuration. If you have a working JU-386 and you want to make it PC-compatible in terms of rotation speed, you need to change the settings at JP1 on the motor PCB (not controller PCB!) as shown in the below table. Installing a switch at pins 1/2 therefore allows you to switch between conventional 300rpm (and therefore allow disks being read/written with your PC) and Casio's own 360rpm for legacy disks. Unfortunately, almost no floppy I've seen so far—apart from the aforementioned Panasonic JU-386 used in the FZ-1—has a "speed select" switch although the commonly used motor controllers have such an input which put me instantly in hunting mode when opening a TEAC FD-235 (of which I got a few so an eventually killed drive wouldn't be that big issue here). Having done so, I played around with a Mitsumi/Newtronics D359. In case you did the same with other drives, just let me know and I'll include it in the below table. (Sanyo) see BA6478HF, but use pin 12 of LB1810; notice that 360rpm will be selected by applying Vcc, 300rpm by GND. (Rohm) Desolder and isolate pin 3 of controller; attach a switch to pin 3 which allows pulling that pin to GND (300rpm) or Vcc (360rpm). Use switchable input clocks (might eventually require switchable PLL components, too) and go for uniform 300rpm setting, this is what e.g. this approach describes. Tweak the Rohm BA6492 or Sanyo LB1817 to half the clock rate and then switch between 300 and 600rpm mode, resulting in 150 and 300 rpm operation. TEAC FD235HD Rev. 3xxx: also this drive is fully jumperable, but makes an adventure game of it. TEAC FD235HD Rev. A529: this drive is also fully jumperable, but makes even more an adventure game of it. 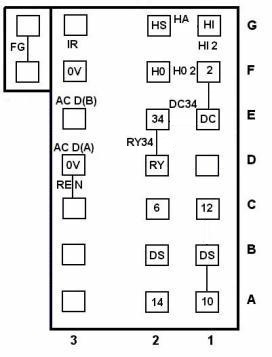 Close D2/E2 (RDY# to Pin 34) and remove E1/E2 (DC# to Pin 34). Also close A1/B1 (Pin 10 to DS0). Mitsumi/Newtronics D359Tx: once you remove the bottom cover, you'll find solder-in jumpers for configuration. Not as comfortable as the JU257, but never the less flexible. Rev. 218-U (IR4N09A): Select Drive 0 via jumper; remove all other jumpers. Remove solder-jumper at S27 (DC#) and close the solder-jumper ad S29 (RDY#). Rev. 4291 and 4430 (T4A34F): Select Drive 0 via jumper; remove solder-jumper S18 (DC#), close solder-jumper S19 (RDY#). Rev. 5291-U (T4A34F): Select Drive 0 via jumper; cut trace at pin 69 (DC#), wire pin 68 (RDY#) to the floppy connector, pin 34. Rev. 6291 (BH95060GKS2): Select Drive 0 via jumper; cut trace from floppy connector pin 34 to floppy controller and rewire pin 34 to the controller pin 10 (RDY#). Rev. 7291-U5 (BH95060GKS2): There's two solder-jumpers for selecting the drive ID, solder it to DS0, rest see 6291. Rev. 8291-U5 (TRN9510A): Unknown (yet) for lack of controller datasheet. Judging from a published NEC FD1231H hack, RDY# is on pin 32, DC# on pin 55. Rev. A291-U5 (TB604HF): Unknown (yet) for lack of controller datasheet. Likewise, a number of revisions of the Panasonic JU257 and the Mitsumi/Newtronics D359 exist that are more or less easy adjustable. Here you'll find a plethora of information and further links -- most of it in German, but your favorite online translator should do a half-way sensible job here. See also here if and how your disk drive's pin 34 behaviour can be changed from disk change to disk ready as needed for proper FZ-1 (or DSS-1) operation. As you can see, only a few lines differ. Casio never planned to use up to 4 floppies in one system, thus /DS1 to /DS3 are disabled (tied to Vcc). Only /DS0 is functional and electrically identical to /BUSY so you can treat this pair as one single signal. To make it short: It shows that the drive is accessible. Since the uPD72065 knows about parameters like head (un)load times and seek time, there's no real need for this signal. However, the FZ-1 does not only need it but even strictly relys on it (see below). Normally, 3.5" PC drives are jumpered to be drive 1 (that's why they need that cable crossing). If you don't want to change the drive jumpering, wire /DS0 and /MOT with their "B" counterparts, otherwise "A". What you also need to do, is connecting /READY to /DS0 as shown in the table's second half. Although it might work for other systems, the FZ-1 doesn't accept the /DSKCHG signal as /READY. Attention: In my special case using the /MOT line for motor control resulted in a permanently spinning floppy. This may result from a defective NAND gate which drives that line -- I just didn't care. Instead of using the /MOT line I wired /DS0 to /MOTEx which works perfectly for me. As long as you take care of your disks being fed into the drive before performing any disk operation, there's no disadvantage besides the fact that usual PC disk drives are thinner than the original one resulting in a small space between drive and drive cover. See this website from Frank Durda IV to check if your drive can easily be converted from disk change to disk ready behaviour on pin 34.